Please give me a Facebook message for any questions. Welcome to Daegu YeStar dental clinic where our goal is to provide you with a painless dental solution. We endeavor to provide all our patients with the highest quality of all aspects of dentistry. Daegu YeStar dental clinic philosophy is to concentrate on preventive and comprehensive dentistry. Preventive dentistry depends upon regular check-ups to monitor the condition of the teeth and gums. Dental health is a matter of life long concern.Regardless of your age you can and should have a healthy mouth. rather than complicated, and often expensive, repairs when things have already gone wrong. "prevention is better than repair ; comprehensive treatment is prevention"
painful treatments to correct. Preventative care normally includes an examination, periodic x-rays, and cleaning. The comprehensive dentistry is also important. Most dental patients are not aware that they may have dental cavities and gum disease. The patient is examined careful and much time is spent on the oral examination. the current condition of their teeth and gums. which includes dental lasers and the use of CEREC system. This system allows partial crowns to be made in just one visit. 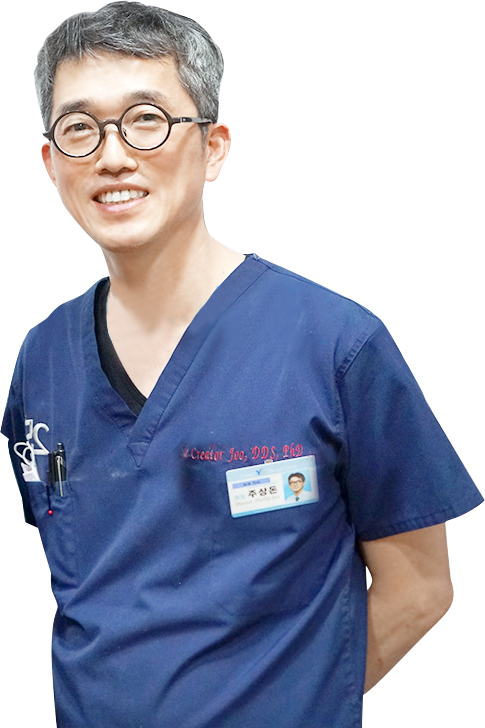 Dr. Joo qualified as a periodontist from the Kyungpook National University, Korea. life long passions is learning and applying the latest technology. His dental treatment philosophy is as follows. maintenance of our natural teeth. set of teeth for the patient. teeth as much as possible. Get exclusive service from our customers. Our goal at Daegu YeStar dental clinic is to provide reasonable, affordable and comfortable dental care for our patients and their families. You will be brought into the examination room where your medical and dental history will be reviewed and will be photographed intra-oral mouth. We will then proceed with a full examination which includes taking x-rays and digital photograph. We always take care of emergencies first, but our goal is to provide you with long-term dental health. Our hygienist's main role is to professionally clean your teeth off stains, plaque and tartar. This is usually called cleaning and polishing. However, perhaps her most important role is showing you the best way to keep the teeth free of plaque. She will also give advice on diet and preventing dental decay. She gets booked up very quick so try to get an appointment as soon as you can. This is when our old patients coming back for routine examinations or when the new ones are accepted to our lists. We inform/discuss with you of our findings. Today's hectic lifestyle is demanding on our health and overall appearance. Everyday things such as tea, coffee, juices,tobacco, food additives and ageing, all contribute to the discoloration of our teeth. The OpalescenceⓇ Tooth Whitening Systems is a non-invasive dental procedure using the most advanced technology of its type, offering patients a safe, quick and effective treatment which removes stains that cannot be removed by everyday brushing. This will depend on your lifestyle. Abstaining from products such as red wine, tobacco, coffee and tea will prolong the benefit of the treatment. The whitening effect last two years, but it depends on patient's lifestyle. No. The OJ Alliance light, which whitens your teeth, will not cause sensitivity. A veneer is a thin layer of porcelain made to fit over the front surface of a tooth, like a false fingernail fits over a nail.Veneer can improve the colour, shape and position of your teeth. A precise shade of porcelain can be chosen to give the right colour to improve a single discolored or stained tooth or to lighten front teeth (usually the upper ones) generally. A veneer can make a chipped tooth look intact again. The porcelain covers the whole of the front of tooth with a thicker section replacing the broken part. Veneers can also be used to close small gaps, when orthodontics (braces) are not suitable. The complete treatment from preparation to fit, no need to take time of the work, no second visit and injection to remove temporary. Old amalgam fillings and gold crowns replaced with CEREC. MTA(Mini Tube Appliance) is a new treatment. A very small tube fits on your teeth and a tiny wire properly aligns them. Because MTA braces are so small, they are more comfortable, less irritating and they fall off much less. Treatment takes only one visit per month. We can carry out different type of fillings to prevent tooth decay or replace the old leaking broken fillings with new ones. A variety of material can be used for restoration. Your dentist will discuss the options with you. If you have a small cavity, it can be fixed by resin, but if you have a large cavity, it can be treated by just one day, like a natural tooth! 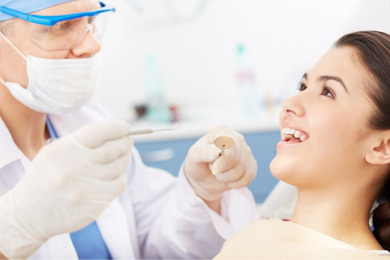 Root fillings or root can treatment is needed when the blood or nerve supply of the tooth (known as the pulp) is infected through decay or injury. Complicated cases might need to be referred to Specialist. They are commonly as knows as caps is an artificial restoration that fits over the remaining part of a prepared tooth or a build up or a post which is making it strong and giving it the shape of a natural tooth. The most common form consist of series of crowns which are bonded together and are fitted over existing teeth on either side of the missing tooth where the artificial crown would sit. They can be made of metal, porcelain bonded to metal or pure porcelain ( for aesthetic reasons ). A dental implant is another treatment option for replacing missing teeth. Instead of resting on the gum line like removable dentures, or anchoring to adjacent teeth as in the case of a fixed bridge, dental implants are surgically placed directly into the jawbone. Made of titanium metal, the dental implant fuses with the jawbone through a process called osseointegration. As a result, the implant remains firmly in place without the often embarrassing clicking noises one experiences while speaking or eating with ill-fitting dentures. Made of titanium metal, the dental implant fuses with the jawbone through a process called osseointegration. As a result, the implant remains firmly in place without often embarrassing clicking noises one experiences while speaking or eating with ill-fitting dentures. Just like natural teeth, implants require regular check-up and conscientious oral hygiene. Much of the success of dental implant treatment depends on keeping your new teeth clean and plaque free. Ask your dentist about home care kits or other cleaning devices, that can work best for you. At your check-up appointments, your dentist will evaluate the success of your home care. 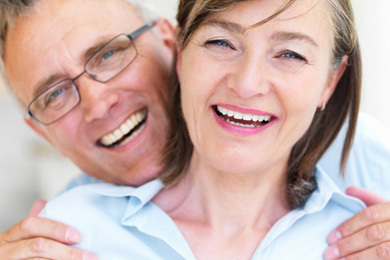 With appropriate care, you considerable help maintain the long-term function of your implants. As traditional of tooth replacement, such as crowns, bridges, partials and dentures, have disadvantages in terms of appearance and function, dental implants are considered by many dentists as the preferred method of tooth replacement. Extraction is carried usually when a tooth in unsavable. Tooth is pulled out of the jaw bone due to number of factors. Gum disease, excessive decayed tooth or badly fractured root, cysts, unsuccessful root filling or overcrowding of teeth prior to getting braces fixed on the teeth can be the reasons behind the extraction. Periodontal disease is the technical name for gum disease, the most common reason for tooth loss in patients after the age of 25.Although relatively painless in the beginning, by the time the first acute abscess occurs, some teeth may already be beyond saving. The first sign of periodontal disease is bleeding gums that are also usually red and swollen. As the disease progresses, the gums will recede causing the affected teeth to appear longer than normal. Finally, in the latter stages, the teeth will loosen to thepoint of being painful and useless, and will either fall out on their own or will have to be extracted. Poor oral hygiene is what causes gum disease. Thoroughly brushing and cleaning between the teeth at least once per day will help prevent the onset of gum disease. If a patient finds it difficult to floss, using thin toothpicks can be an acceptable alternative for cleaning between the teeth. Although easily preventable, periodontal disease is often difficult to maintain once the deterioration process begins. Our dental clinic has various dental lasers, including Er-Yag, Diode and CO2. Dr. Joo gives presentations to other dentists about laser's dental therapy in Seoul, Busan and other major Korean cities. He has a lot experience in laser therapy. Dental laser has 3 major effects including bleeding control, anti-inflammatory and analgesics effects. These kinds of effects couldn't be obtained previous dental treatments. As a result, gum treatment is more effective than before. precautions for a good prognosis. 1) Continue your regular brushing and flossing. 3) Call our Surgery if you are in pain or if you have any questions. 1) The gauze pad placed over the surgical area should be kept in place for one hour. 2) TAfter this be, the gauze pad should be removed and discarded. If the bleeding continues new gauze should be placed and pressed on for another 45 minutes. 1) To minimize further bleeding, do not become excited do sit upright, and avoid exercise. 1) Vigorous mouth rinsing or touching the wound area following surgery should be avoided. 2) This may initiate bleeding be causing the blood clot that has formed to become dislodged. 3) Take the prescribed pain medications before you begin to feel the local anaesthetic becoming diminished. This will anticipate discomfort and prevent prolonged period before the medication takes effect. 5) controlled by first rinsing with cold water or wiping any old clots from your mouth, then placing a gauze pad over the area ad biting firmly for thirty minutes. The swelling that is normally expected is usually proportional to the surgery involved. Swelling around the mouth, cheeks, eyes and sides of the face is not uncommon. This is the body's normal reaction to surgery and eventual repair. The swelling will not become apparent until The day following surgery and will not reach its maximum until 2-3 days post -operatively. However. the swelling may be minimized by the immediate use of ice packs. A frozen gel pack should be applied to the sides of the face where surgery was performed. The ice pack should be alternated from side to side in twenty-minute intervals continuously while you are awake. After 48 hours, ice had no beneficial effect. If the swelling or Jaw stiffness has persisted for several days, there is no cause for alarm. This is normal reaction to surgery. Thirty-six hours following surgery the application of moist or dry heat to the sides of the face is beneficial in reducing the size of the swelling. For moderate pain, Panadol (paracetamol) or Nurofen(Ibuprofen) unless medically contradicted. Refer to package insert for proper dosage and consult Pharmacist for further advice. For Severe pain please call the surgery for a prescription of strong painkillers. The prescribed pain medicine will make you sleepy and will slow down your reflexes. Do not drive a car or work around heavy machinery. Pain or discomfort following surgery should subside more and more everyday. If pain persists or indeed seems to be increasing after day three, it may require attention and you should call the surgery. No rinsing of any kind should be done until the day following surgery. The day after surgery you should to being rinsing at least 5-6 time's day, especially after eating, with a cup of warm water. Continue rinsing for one week. In some cases, discoloration of the skin follows swelling. The development of black, blue, green or yellow discoloration also known as "bruising" is due to blood spreading beneath the tissues. Moist heat applied to the area may speed up the removal of discoloration. If you have been placed on antibiotics take the tablets or liquid as directed. Discontinue antibiotic use in the event of a rash or other unfavourable reactions. Call the surgery if you have any questions. If numbness of the lip, chin or tongue occurs there is no cause for alarm. As stated before surgery, this is usually temporary in nature. You should be aware that if your lip or tongue is numb you could bite it and not fell it so be careful. Contact the Dentist if you have any questions about this. Slight elevation of temperature immediately following surgery is not uncommon. If the temperature persists, notify the office. Ibuprofen should be taken to reduce the fever. You should be careful going for the lying down position to standing. Since you werenot able to eat or drink prior to surgery, low blood sugar and the pain medications can make you dizzy. Before standing up, you should sit for one minute then get up. Occasionally, patients may feel hard projection in the mouth with their tongue. They are usually not roots; they are bony walls, which supported the tooth. These projections usually smooth out spontaneously. If the comers of your mouth are stretched, they may dry out and crack. Your lips should be kept moist with an ointment such as Vaseline. Sore throats and pain when swallowing are not uncommon. The muscles get swollen. The normal act of swallowing can then become painful. This will subside in 2-3days. Finally sutures are placed in the area of surgery to minimize post-operative bleeding and to help healing. Sometimes they become dislodged; this is no cause for alarm. Just remove the suture from your mouth and discard it. Sutures would need to be removed and you will be given an appointment approximately one week after surgery for the removal. The removal of sutures requires no anaesthetic or needles. It takes only a few minutes and there is no discomfort associated with this procedure. There will be a cavity where the tooth was removed. The cavity will gradually heal over the next month filled in with tissue. In the mean time, the area should be kept clean especially after meals with water rinses or a toothbrush. Brushing your teeth is okay-just be gentle near the surgical sites. 1) You may experience some pain, bruising around your lips and/or some swelling, especially after extraction of impacted wisdom teeth. Ice bag application and medication prescribed for you will help to minimize your discomfort. 1) Avoid eating or drinking anything hot on the day of your extraction. Also, do not rinse your mouth, do not use a straw for drinking. 2) Do not spit and do not drink carbonated beverages. Do not brushing on the day of the surgery you can resume your brushing and flossing the day after, gently. 1) Pressure should be placed on the gauze pad that has been placed on the extraction site for one hour. If the bleeding continues new gauze should be placed and pressed on for another 45 minutes. (It can cause serious injury to their soft tissue). 3) Please take all the medication you have received based on the instructions given to you. 4) For more complex Surgical Procedures including Impacted Wisdom Tooth Extraction, Implant Surgical Procedures, etc; you will receive an ice wrap which should be worm for the rest of the day and until you go to bed on the day of surgery only (10 minutes on and 5 minutes off). Individual instruction for various surgical treatment will have some unique directions which will be supplied to you at the time of your treatment. 1) As you ingest food, chew on the other side of the treatment as much as possible. 1) To avoid lifting your temporary, avoid chewing on sticky and hard food (chewing gum, ice). Try to chew on the opposite side of the treatment as much as possible. 1) Crown and bridges usually take 2 or 3 appointments to complete. On the first appointment the tooth/teeth are prepared and impressions are taken and a temporary crown is placed on your tooth/teeth. 2) You may experience sensitivity, gum soreness and slight discomfort on the tooth/teeth, it should subside after the placement of permanent crown. 3) Whenever anesthesia is used, avoid chewing on your teeth until the numbness has worn off. Temporary crown is usually made of plastic based material or soft metal. It could break if too much pressure is placed on it. 4) The crown also may come off if it does, save the crown and call our office. The temporary crown is placed to protect the tooth and prevent other teeth to move.If it comes off it should be replaced. 5) After the permanent restoration is placed you may feel slight pressure for a few days. Also, the bite may feel different for a day or two. But if the bite feels uneven or you feel discomfort on chewing on the tooth after 2-3 days call our office. Delaying the necessary adjustments may damage the tooth permanently. Call our Surgery if you are in pain or if you have any questions. 1) Take all the prescribed medications based on given instructions. 2) Apply an ice bag on your face over the surgical site on the day of surgery for 10 minutes on and 5 minutes off. 1) DO NOT raise your lips with your fingers to inspect the treated area. 2) DO NOT brush teeth near the surgical site. Brush teeth in the rest of your mouth. 3) There is often a temporary loss of feeling in the operated area and the tooth may feel loose. 1) Keep your next appointment on time for removal of sutures and follow up checks. 2) Do not smoke, spit or use a straw on the day of the surgery. (avoid smoking for a few days after the surgery). 3) Should any difficulties occur, do not hesitate to call our surgery anytime. 1) ush your teeth everyday before you go to bed and 1hour later, put the whitening gel in your retainer. 2) Dry your teeth perfectly( using gauze ) and put on your retainer. 3) After waking up, brush your teeth slowly and smoothly without toothpaste before breakfast. If you haven't eaten breakfast, you should brush your teeth normally. 4) Wash your mold and dry it with water. 5) Keep the whitening gel cool( use a refrigerator ) and keep the retainer dry. 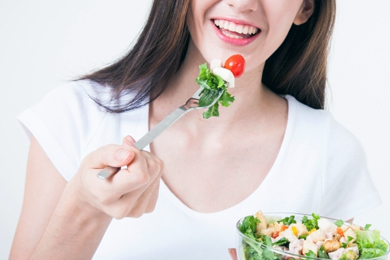 -> If you do to have colorful food, make sure you brush your teeth immediately. 2) If you have a scratch on your tooth/ tooth decay/ damage. you may feel sensitivity to the cold. 3) During whitening you may feel some hyper-sensitivity.But, you don't need to worry. After treatment your teeth will be back to normal. 4) ou may see a slight variation in the color on each tooth. This is because the whitening effect depends on your tooth condition and natural color. By the end of treatment, you should see very similar coloring of teeth. 5) If you are a smoker, you should avoid smoking. This is very important. 1) The effects of the treatment usually lasts up to 2-3 years.but will depend on your eating and brushing habits. 2) You have an appointment 1year later after treatment to check the color at that time.If you want extra whitening, then you can receive it.